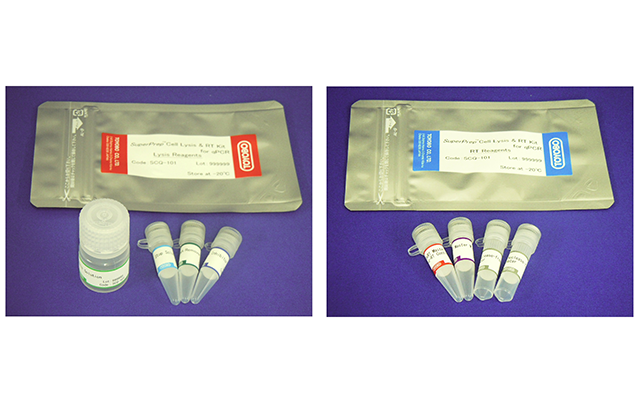 SuperPrep® II Cell Lysis & RT Kit for qPCR (Code No. SCQ-401) consists of "Lysis Reagents" and "RT Reagents" for synthesis of cDNA templates for real-time PCR assays. "Lysis Reagents" prepares cell lysates containing RNAs that can be used as templates for reverse transcription. "RT Reagents" contains reagents for reverse transcription, optimized for efficient cDNA synthesis from crude lysates. The synthesized cDNA can be applied to real-time PCR directly. This assay system is suitable for high-throughput assays. In the previous version, it was necessary to add Stop Solution after adding Lysis Solution. In SuperPrep® II, cell lysates with lysis solution can be used as templates for cDNA synthesis directly. Moreover, high sensitivity detection is possible from a wide variety of mammalian cells than in the previous version. With this assay system, it is possible to synthesize template cDNA for real-time PCR from cultured cells conveniently and quickly. SuperPrep® II Cell Lysis Kit for qPCR (Code No. SCQ-501) is an option of "Lysis Reagents". The cell lysate prepared by "Lysis Reagents" can be applied to one-step real-time PCR.